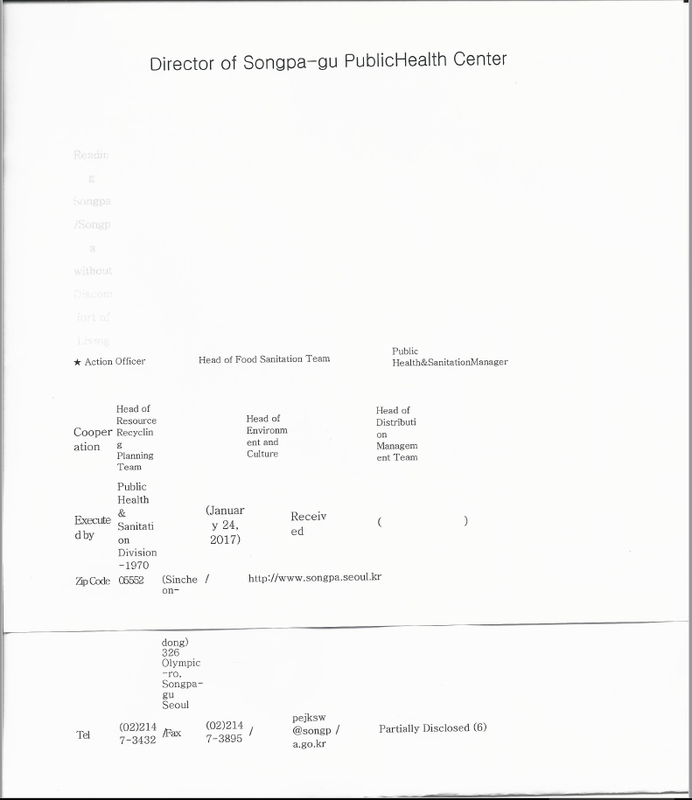 We have received a couple of different responses from Seoul Songpa District regarding our “Sister City Campaign – Seoul Songpa-District, South Korea – Fairfax County, Virginia”. Click HERE for the campaign page. 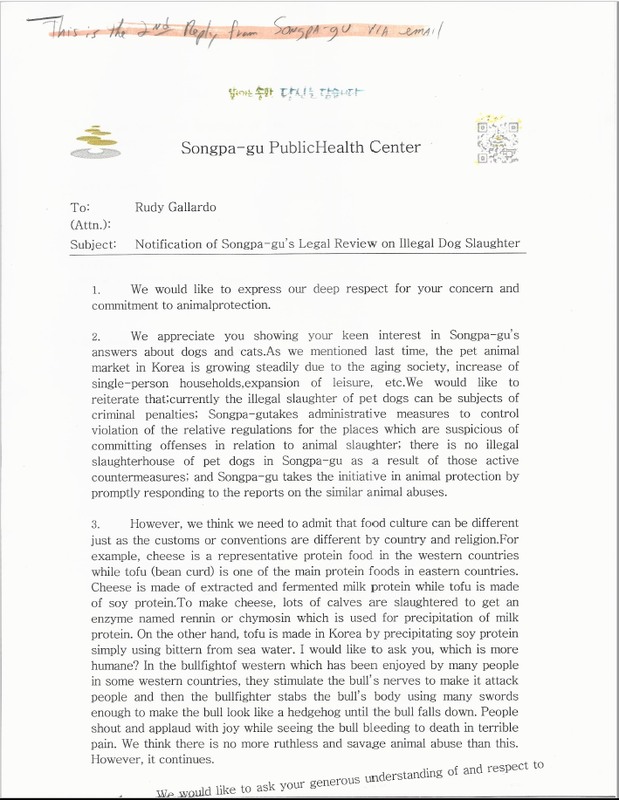 Songpa District’s response is disingenuous, untruthful and typical for bureaucratic government officials, which claims that “pet dogs” are not being slaughtered. 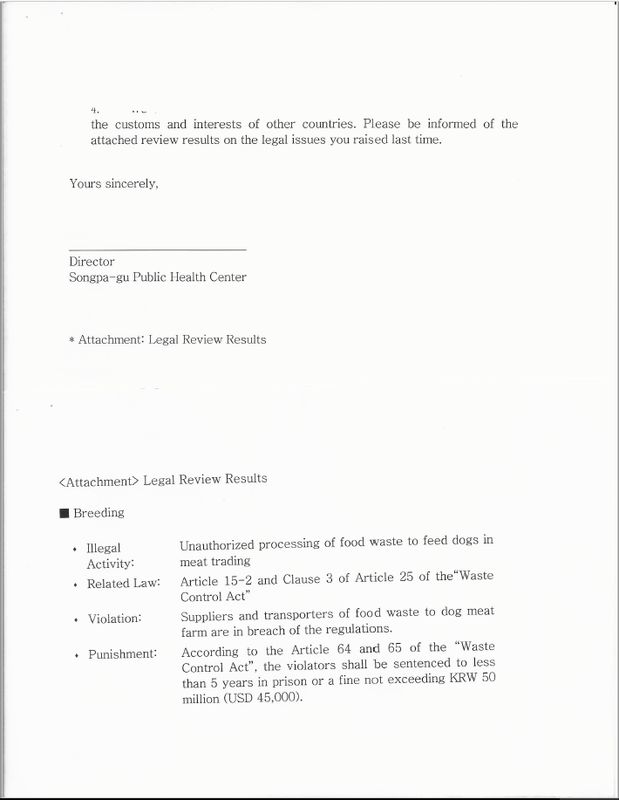 They think this is an answer to all questions regarding the dog meat cruelty. All dogs are slaughtered in South Korea for the meat industry, even stolen pet dogs. 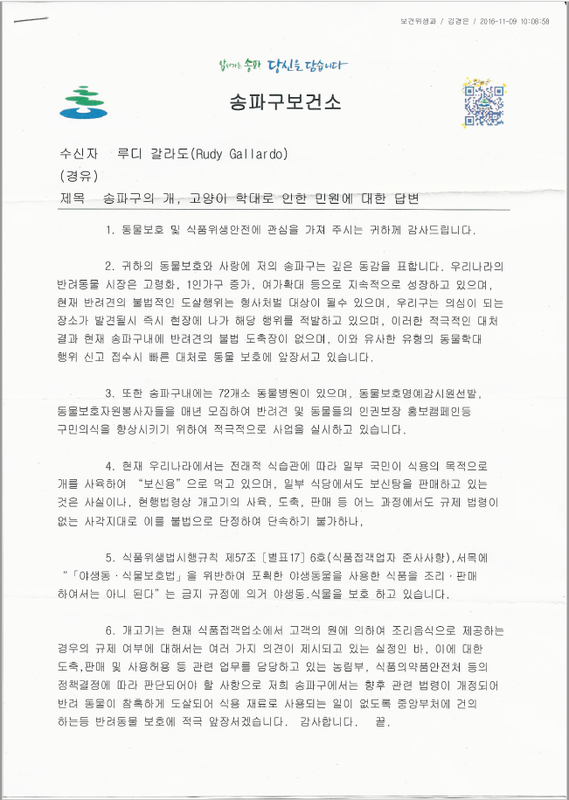 Songpa District had stated that we do not have “generous understanding of and respect to the customs and interests of other countries”. Dog meat consumption is NOT a custom. 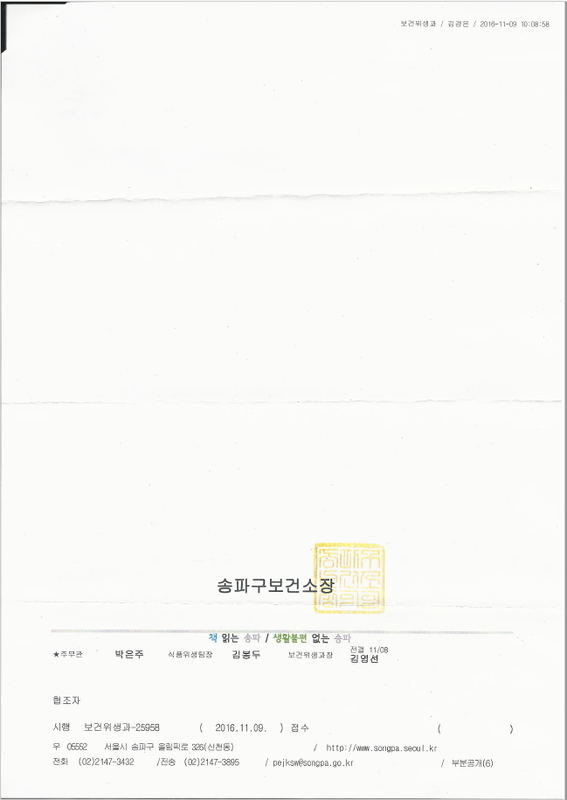 A cultural custom must be a long-held, established practice of the cultural majority, and only a minority of South Koreans consume dog and cat meat. 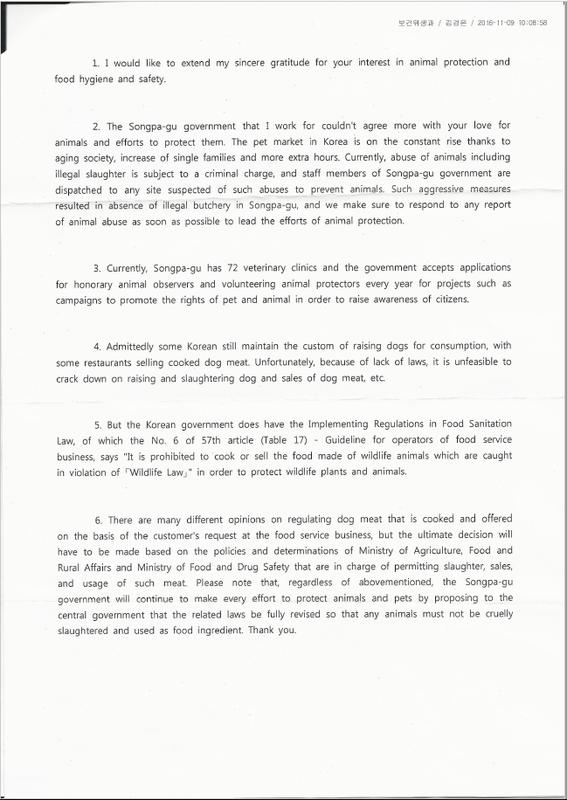 Songpa District, you must end the illegal and shameful dog and cat meat cruelty in your district immediately. Thank you, Rudy Gallardo, for sharing these letters with us and for all your efforts to help end the cruelty to dogs in South Korea. We are also thankful to the Fairfax County Chairman of the Board of Supervisors, Sharon Bulova , for kindly supporting our campaign and taking action to raise concern with Songpa District. One campaign at a time, one letter at a time, we can step closer to the end of horrible cruelty toward animals.